Today Brembo officially launches its braking system for all Energica motorbikes in the upcoming Moto-E championships, the fully electric single brand competition that will get underway on five European circuits for the 2019 World Championship, together with MotoGP, Moto2 and Moto3. The announcement is yet another challenge for the Bergamo based company which, after moving into the FIA Formula E championship, has now also expanded its presence in the main two-wheel electric motor championships. 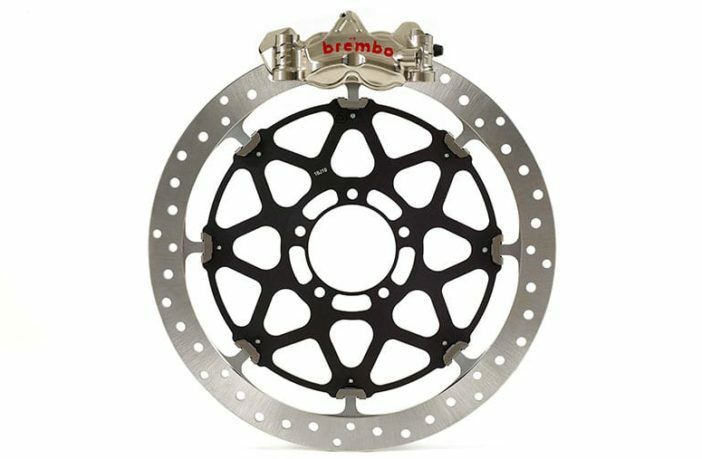 – Steel disc: Developed from experience Brembo gained with Superbike and MotoGP, the “T-Drive” steel disc is 336 mm in diameter and 7.1 mm thick, with a configuration specifically designed for Energica Ego Corsa bikes. Eight “T” pins machined into the disc and eight outlines on the bell make it possible to eliminate the drive pawls. This special configuration enables braking torque to be transmitted more effectively, based on specific studies into manufacturing tolerances. T-Drive also offers better resistance to thermal-mechanical stress, especially in very extreme conditions of use, such as racing. The T-Drive system allows both radial and axial flotation and reduces the overall weight of the disc, thereby ensuring considerable driving advantages. T-Drive discs are also available for the most common maxi-sports. – GP4-PR enbloc front caliper: Machined from solid, this caliper was previously used in the MotoGP championship together with steel discs until the 2017 season, when steel discs were used for races in wet conditions. It has 4 titanium pistons with different diameters. – Radial master cylinder – 19 mm diameter and 18 mm centre. – Z04 pads: Already used in Superbike championship races, the SuperSport championship and Moto2, these pads are also available on the market for ordinary enthusiasts who enjoy track driving on their own bikes. Characterised by high friction and constant performance, especially at high disc temperatures, Brembo Z04 pads ensure excellent and uniform braking for the entire duration of a race, making fading effects much less likely. Another important innovation is the absence of the clutch pump, since there is no clutch on Energica bikes in competition races. Not only Brembo but also Marchesini: Brembo will equip all Ego Corsa motorbikes with Marchesini 7-spoke forged aluminium rims. The new championship exclusively for electric motorbikes is the ultimate expression of the new direction in the motorcycle industry, which, albeit less markedly than the automotive sector, is putting its weight behind electric and other new forms of eco-compatible mobility. The new championship is therefore a very interesting development platform for Brembo braking components. As already seen in other classes, the championship will enable Brembo to experiment with technical solutions in the coming years that will be transferred to the future electric motorcycles and scooters that may well characterise mobility going forward.